Anyone who has strolled along the bustling streets of Madrid has probably witnessed the scene: a group of street vendors displaying wallets, belts, sunglasses and other articles on a blanket on the floor that is always tied with two crossed wires. Each time the police approaches, the so-called „manteros“, the vast majority from Senegal, quickly pull the strings, turning the blanket into a huge bag which they carry on their backs as they swiftly flee from the authorities. Considered an offense, with prison sentences ranging from six months to two years, street sellers live in constant turmoil and fear of arrest. Recently, one of the frequent episodes of police harassment resulted in the death of a “mantero”, the Senegalese Mame Mbaye, 34, who regularly sold perfumes in the centre of the Spanish capital. As had happened numerous times before, having been approached by the police, he fled towards the neighbourhood of Lavapiés, where he lived. But this time, the escape had a dramatic end, with the death of Mbaye, victim of a heart attack. The tragedy caused shock and outrage amongst his fellow street vendors, as well as residents of Lavapiés who, in the following days, took to the streets by protesting against the criminalisation of street vending and the clandestine nature to which most of these immigrants are condemned to live. Despite having lived in Spain for 14 years, Mbaye was never able to obtain a residency permit. Like him, hundreds of immigrants in Spain live in an irregular situation, due to practically unattainable requirements for residency to be granted, such as a 40-hour work contract. Many of them are, therefore, forced to sell on the street to survive. However, the criminalisation of this activity ultimately blemishes their criminal record, hindering their ability to gain citizenship. 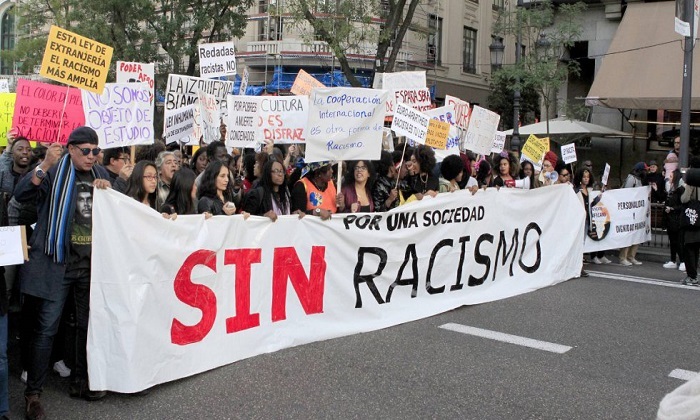 In response, humanitarian organisations, have accused the ruling conservative Popular Party in Spain of fomenting institutional racism, which has culminated in serious consequences for the mental and physical health of these migrants. To avoid further unnecessary deaths like Mbaye’s, Spain must, therefore, urgently change its inhumane and discriminatory laws. Because survival shouldn’t be a crime. With the world fast moving away from the much cherished idea of globalisation, in Afghanistan the need for regional cooperation is even greater. It has been proven time and time again that the illegal chain system behind the consumption of drugs is the problem, not the culture of drug consumption.